Here is a two-sided foldable board that surely belonged to a combination box, but of which I do not have any further information except a companion board that must have belonged to the same box. These boards measure 28 x 28 cms. One of them has a game called "6-Tage-Rennen" coupled with Halma. The second board has a ludo/parcheesi variant called "Nur nicht ärgern lassen!" coupled with a game called "Allerlei von zwölf bis zwei" which looks like a betting game using a pair of dice (see below). 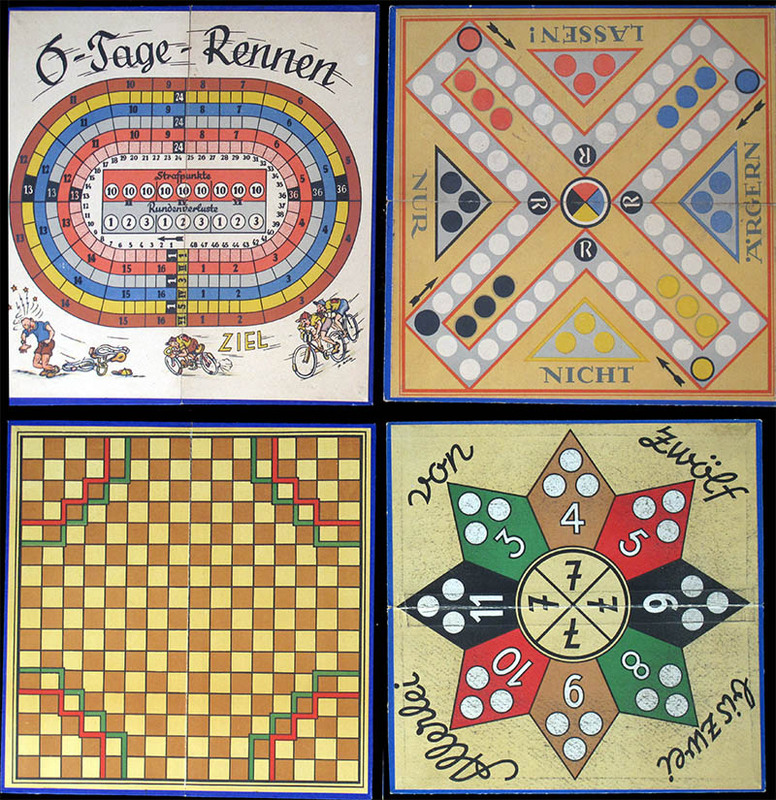 The parcheesi game is mentioned in a german site about parcheesi variants, where it they present a similar board coupled with a Halma game made in Leipzig by Rudolf Arnold Verlag Leipzig "ca. 1940". Of course Germany was in war in 1940, so we have to take this information with a pinch of salt. 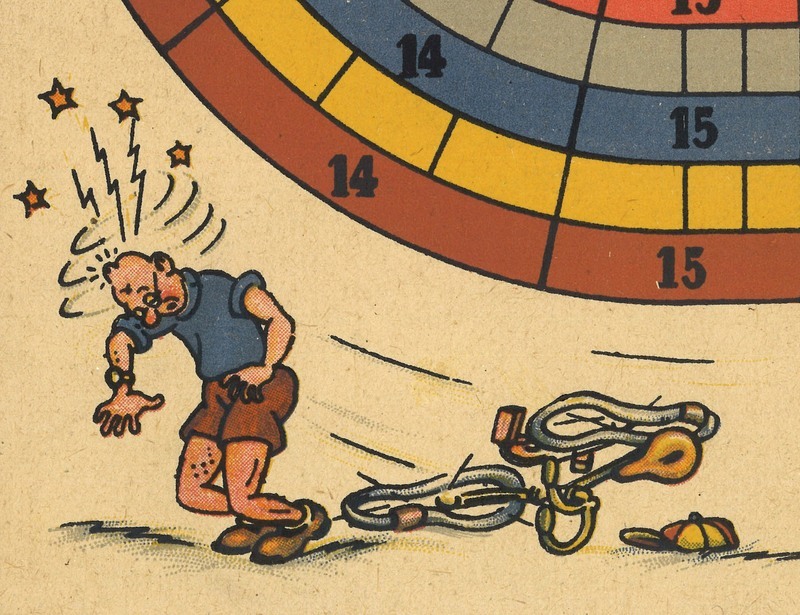 My first impression is that this game (I mean the cycling game) was made in the 1930s, but you never know. If you have more information about this game (or the rules), please contact me. I do not have the rules of this game. However, I can guess that it was played by 3 players, each of them with a team of two riders. 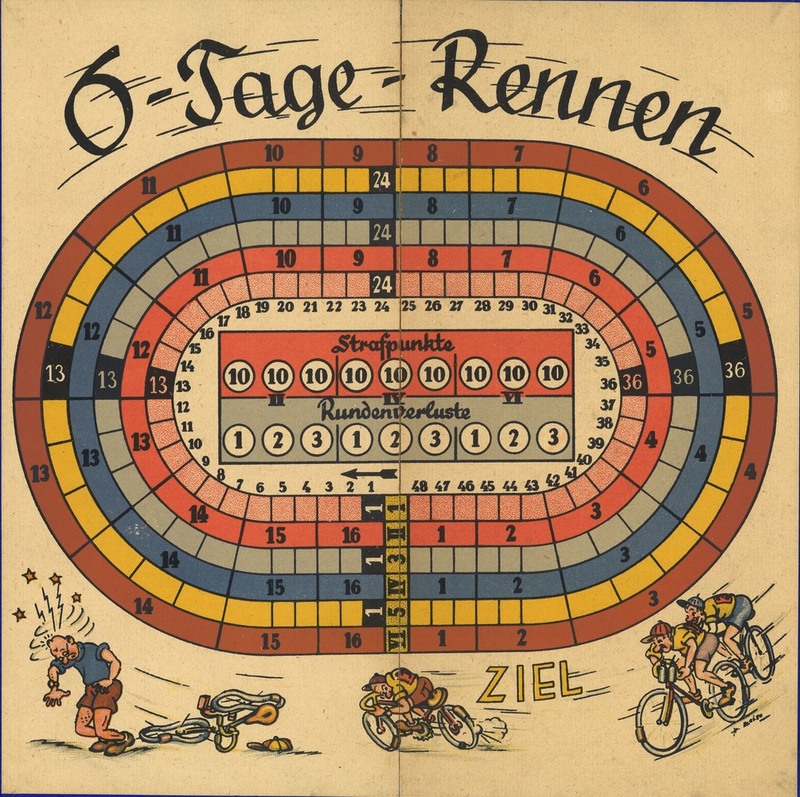 One of the riders would be placed on the 48-square track of the matching colour, and the second on the corresponding 16-square track (compare with this game). Another thing that strikes at first sight in this board is the use of bllackletter (aka "gothic script"). Although it is generally associated with pre-war Germany, I guote from Grant Carruthers' Beyond the Wall: Typography from the German Democratic Republic: "After WW2, the blackletter in the West was tainted by its associations with the Nazis and part of the Allied ‘denazification’ process included the discouraging of blackletter forms. The Soviet authorities however disliked Modernist approaches in art and design and were apparently disinterested in condemning the blackletter face as a particularly Nazi form." 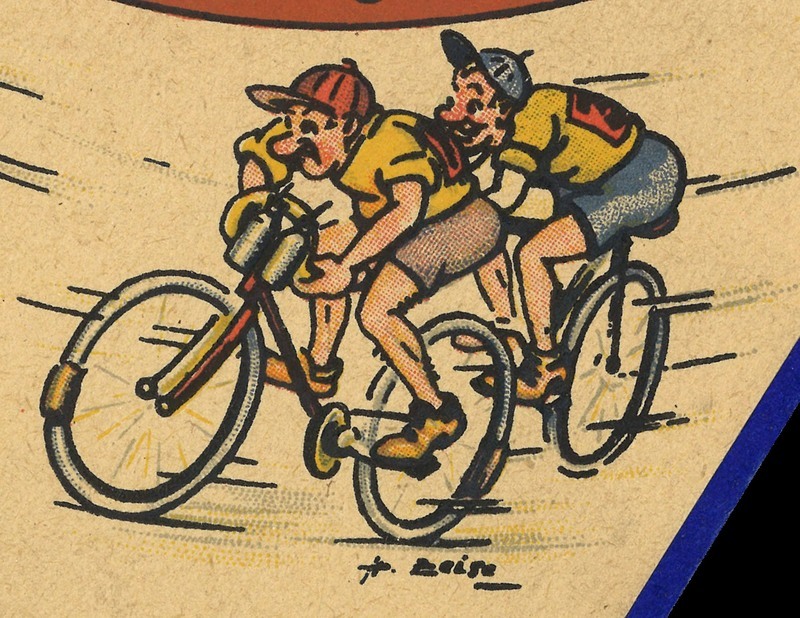 The riders depicted on the board look like pre-war cyclists, don't they? The two sides of the boards. In Germany, Parcheesi/Ludo games (technically called cross-and-circle games) Were introduced during WWI. They are known as "Mensch ärgere Dich nicht" and have a distictive board. Both the name of the game and the specific board design were protected by some kind of patent and/or copyright (let's leave the technicalities aside). This is surely why the game found with 6-Tage-Rennen has a different name (which nevertheless means basically the same in German) and a different layout. 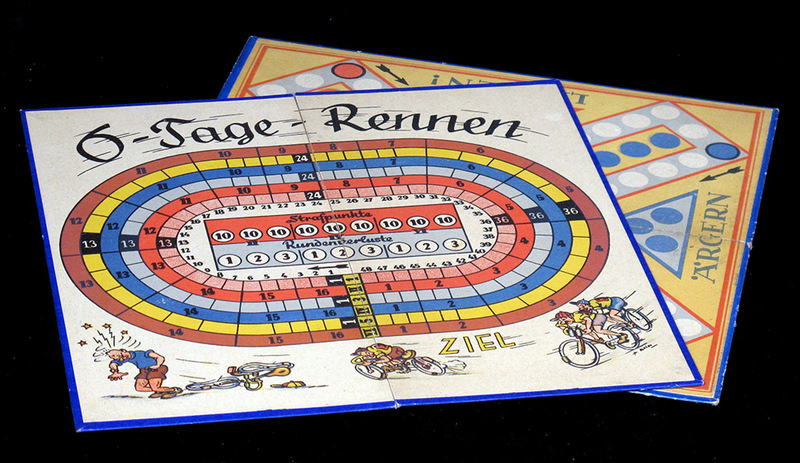 Unlike the Rudolf Arnold board mentioned above, in this case it is the cycling game that is coupled with the Halma board, while "Nur nicht ärgern lassen!" is coupled with "Allerlei von zwölf bis zwei". However the coincidence is important enough to make me think that the cycling game was probably made by Rudolf Arnold too. Whether it was made before the war (in which case the parcheesi/halma game would be a later reprint) or not is hard to say until I find more information.